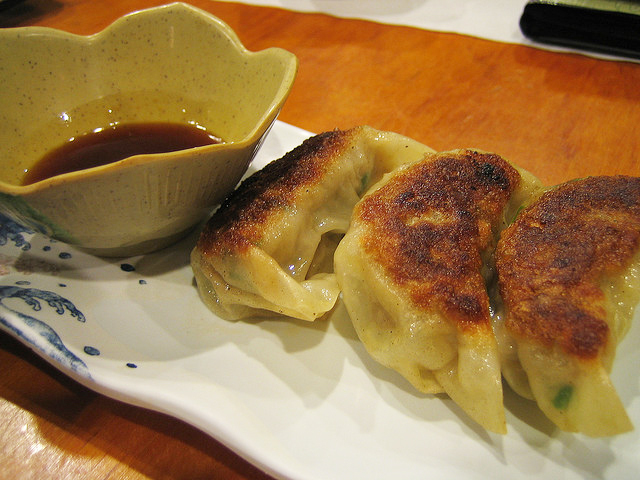 Have you ever had gyoza at a Japanese restaurant? Gyoza are dumplings made of a thin skin of dough with a small amount of (usually pork and chinese cabbage) filling.They are sealed like a turnover and most typically fried and then steamed. They are delicious. The Chinese were first off the mark in history with this dish, where they are called "Jiaoza." They were not introduced to Japan until the 1940s, most likely adopted after WWII. They have become so popular in Japan that there is a Gyoza Stadium in Osaka which also has a museum with history and information about the different kinds of dumplings. Great gyoza is very easy to achieve at home. As with most Asian cooking, the preparation takes longer than the cooking. That's a large part of the beauty of cuisine from that area of the world. Quick cooking retains the individual character of each ingredient. So keep that in mind when preparing your gyoza. Gyoza would be a nice recipe to make when having a get together with friends. They can cut down on your workload and share in the fun! The secret to crisp yet well cooked gyoza is to fry the bottom and then steam right in the same pot. Gyoza can be boiled and then fried, but I find the fry/steam method gives a far superior result. The pomegranate juice with this recipe makes a deep red, sweet, tart dipping sauce that nicely complements the shrimp. Using pre-made wrappers isn't really cheating and greatly simplifies the overall process. They're all the same size and thickness, which is difficult to achieve if you roll your own wrappers. But if you wish to go the extra mile, feel free! Combine all the gyoza ingredients, except the wrappers, in a bowl, mix well and allow to marinate for 1/2 hour on your counter. Mix together the ponzu ingredients in a bowl and set aside. Taste and adjust as desired. 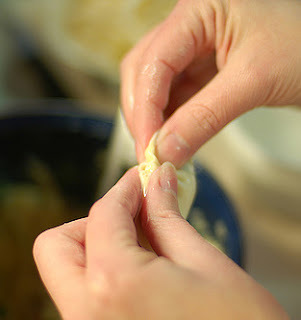 Take 1 tbsp of the filling and place in the centre of a wonton wrapper. Moisten the edges and close to make a semi-circle. Press together well so the gyoza doesn't separate during cooking. Sit on a cookie sheet and press down lightly to make a flat bottom with the sealed edge pointing upward. Heat the oil over medium high heat in a wide saucepan that has a cover. When hot, place gyoza flat side down and fry. Do not crowd. You will have to cook the gyoza in batches. Let cook until the bottoms are well browned and they release from the bottom of the pan. This will take between 3-5 minutes. Pour 1/4 cup of water into the pan with the gyoza and immediately cover the pot. Allow to steam for 3 minutes. Remove the gyoza from the pan and keep warm while you repeat with the remaining gyoza.